It's graduation season around the nation and in honor of our country's most recent graduates, I thought it would be appropriate to award this year's Senior Superlatives. I plan on doing my best to avoid my own glory days (yes, I am now attempting to sound like Bruce Springsteen as I belt it out) of high school as I award superlatives to a few favorite titles. 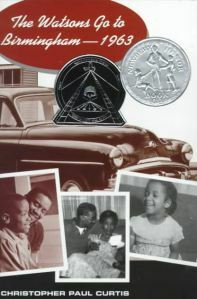 By the time readers come across the part where Byron gets his tongue stuck on the side view mirror, they're hooked on Christopher Paul Curtis' writing style and with his characters in The Watsons Go To Birmingham - 1963. As students become more familiar with the setting, as the Watsons head from Flint, Michigan to Brimingham, Alabama, they will naturally have questions and a desire to learn more about the time period. 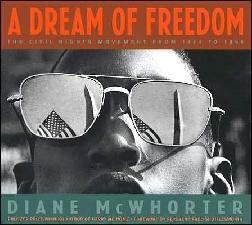 Diane McWhorter's A Dream of Freedom is a perfect informational text to pair with the Watsons when students need to know more about the Civil Rights Movement. Tom Angleberger is hilarious. 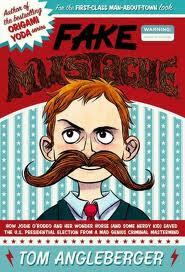 My students and I first became hooked on his Origami Yoda series, and were excited when Fake Mustache was released. Lenny and Casper enter a novelty store where Casper decides to purchase a fake mustache. Now, armed with the fake mustache, Casper gradually becomes more sinister and attempts to take over the world! Oh, all while sporting a man-about-town suit; and who doesn't look better when they're wearing something so dashing? 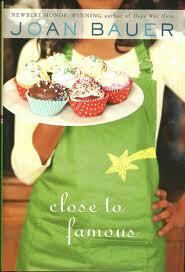 The Goodreads description of Close to Famous deems it "full of heart." This is certainly accurate as Joan Bauer takes the reader into a small town and introduces us to a quirky cast of characters who quickly become so important to Foster's life that they are almost family. Foster's dream is to one day have her own cooking show and if she can overcome some major barriers, she may just be famous one day. Could it be any more obvious? I would like to thank my mom for giving me the giant teeth and mouth that my sister and I both have. 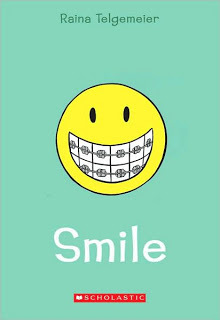 It is those giant teeth and mouth that actually did allow me to win Best Smile way back in the day. However, it was not without A LOT of work beforehand. My journey may not have been as extensive as Raina's, but her story definitely hit a nerve (pun intended, sorry!). 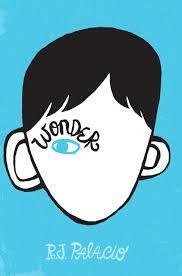 The award for best teacher goes to Mr. Browne in R.J. Palacio's Wonder. As teachers, don't we all hope to motivate and inspire our students? We hope to help them learn and grow from a variety of different experiences and really just to leave a positive impression on their lives. Mr. Browne and his precepts encourage his students to think about life with a wider lens and he has the same impact on our own students. Mr. Browne deserves a standing ovation because, in the words of Auggie Pullman, "Everyone deserves a standing ovation because we all overcometh the world." I loved this post. I wonder how your students would do with this type of things at the end of the school year. They'd definitely want to use their reading log! That would be a great conversation to have with them. We'll have to do that in the spring!